“Where do you come from”? “How long do you have to meditate for”? 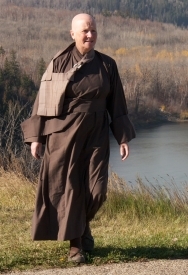 “Is it hard being a monk”? Thoughtful pause, “Well, being a monk means trying to be the best person you can be. And that’s not easy for anybody”. Long pause with thoughtful look. “Now say thank you”, says mom. Latter I gave him a wave, he waved back. The answer came from one of the other monks I was out with. Good answer. This story made me smile. Thanks.